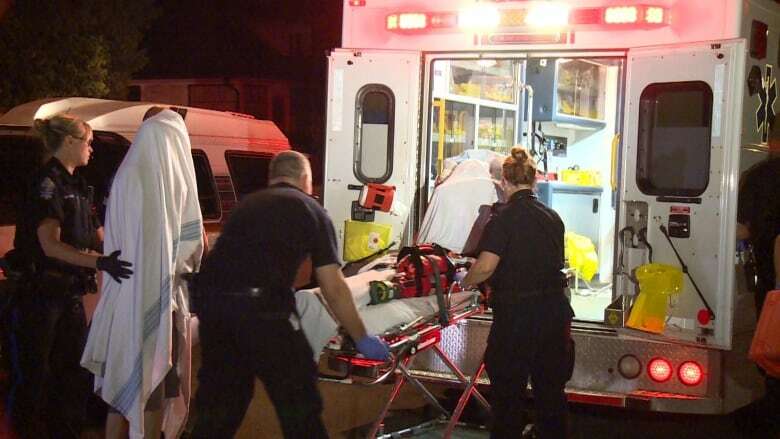 Two people were taken to hospital in New Westminster, B.C., after they were attacked by a dog early Thursday morning. A vicious pit bull attack that left a woman with life-changing facial injuries has raised questions about whether New Westminster council was right to drop a bylaw against certain types of dog. In the early hours of Thursday morning, police arrived at the apartment at 325 Ash St., to find a bloody mess. The dog —which had been secured on the balcony — had also bitten a man, whose injuries were less serious. Two children were also found in the apartment unharmed, having slept through the whole incident. What prompted the dog to attack is unknown. James Doan, supervisor of animal services in New Westminster told CBC News it was untagged, so its ownership is also unconfirmed. The woman was a resident of the apartment, and neighbours said they had seen the dog in the building on a few occasions. In 2013, council dropped a vicious dog bylaw that was connected with certain breeds, including those associated with the type known as pit bulls. The bylaw prevented residents in New Westminster from owning such dogs. An investigation will determine if the dog in Thursday's attack will be destroyed or returned to its owner, something at least one resident finds concerning. "No matter how good they can be,alter they can change on a dime," neighbour Lori Hilton told CBC News. "They are like walking sharks,"